There are two options to get to La Chunga village Darien is only open by land:To get to the following community, Eco-lodge La chunga, Sambu community river , Corredor Bilogico Bagre (National Park Darien). 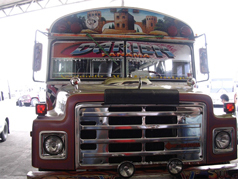 - Public Transportation: From Albrook Terminal in Panama City, Take a Darien Bus to Meteti Terminal (5hrs, $9 p/p). From Meteti Terminal, take a Puerto Quimba Busito to Puerto Quimba (30mins, $2). From Puerto Quimba, take a Sambu Boat taxi to La Chunga (2hrs, $22.00 p/p). - Private Car: Drive from Panama City to Puerto Quimba (Feel free to leave your car in the parking lot, Parking is free and safe). Take a Sambu Boat taxi to La Chunga. You can spend the night in Meteti in the (Hotel La felicidad Meteti Darien) you have to be 1 day before and then next day very early morning because you get up at5:00 am in the morning and then take taxi (1$ p/p) to meteti bus station you will take local bus from Meteti bus station via Puerto kimba to get there6:00 am you have to be 1 hour before, we recommend you one arrive to the ports there please ask people where is check in to get give you personal information in the list passengers travel to La Chunga villages Sambu river for the taxi boat the cost at (22.00 p/p) somebody will wait you in the port La Chunga village the name guide is Rutilio Barqueño or Solarte Barqueño. Notice: Boats to La Chunga Sambu river Darien only leave at 6:00 AM. Please notify us and we will reserve a space on the boat for you the guide boat will arrive early to Puerto Kimba Darien. There are regular transportation boat taxi that travels via to La Chunga Sambu Darien – Puerto Kimba- La Chunga villages weekly: Monday, Tuesday, Wednesday, Thursday , Friday , Saturday and Sunday only. Traveling to Darien requires that you check-in with the immigration booths at Darien and Puerto Quimba. They will only ask you for your Passport Information and how long you will be staying. If there are any problems, just explain that you are Tourists. If you speak spanish, that is great. If not, I would recommend our guide who can accompany you from Panama so you have pay service guide in english at 100$ per day and guide in Spanish at: 20.00 per day. The second option is by land: If you are coming at 9:00 am in the morning from Panama City you first need to take a bus from Terminal Albrook Panama to Darien-Meteti cost at $9.00 p/p along the panamerican highway (5 hours). From Meteti terminal cost at $2.00 p/ p you will take a smaller bus to Puerto Quimba cost at $ 5.00 p/p From Puerto Kimba you will to take a water taxi boat along the Hotel Tuira La Palma Darien (30 minutes). The anything cost is public transportation are not included in the packages (around 6 hours travelling). Travel Darien Panama teams recommends all travelers who choose the option of land transportation to be at La Palma Darien community 1 day before get sleep in the Hotel Tuira La Palma the cost at $20.00 p/p per night Darien stay overnight, to avoid bad weather conditions or storms on the pacific coast and due to this the company recommend to travel in the morning. If you are tired upon arrival to La Palma Darien you can find rustic accommodations Hotel Tuira La Palma Darien. The next day an employee from Travel Darien Panama will be pick you up, then take by taxi boat water boat to your Choice of the following destinations transfer to Bungalow Eco-lodge La Chunga in the La Chunga village, Sambu river Darien and National Pack Darien (Corredor Bilogico Bagre). It's important that you plan your trip at organization Travel Darien Panama before you leave, and to remember your passport for 3 police station check points. The above information is for security reasons and for the Border Police to have a record *SENAFROM* National Police Service of Frontier Darien. The tour begins on La Palma community, and Travel Darien Panama will pick you up on boat to start the expedition. Travelers have the option to rent an SUV (4 by 4) or if traveler have his own vehicle, he could use it; and park them at Puerto Kimba without inconvenient, paying only to the person who will take care of the car, could be a police man or a local resident that lives close to Puerto Kimba. If you decided to take the option via bus, the cost of the bus from Panama to La Palma Darien is not included in the excursion. We recommend that before you take this option, notify us 1 month or 15 days prior as a minimum, via E-mail or by phone, to avoid inconveniences.